One thing about Singapore is that you have many many many malls… and fewer opportunities to access world-renowned art exhibitions. I’m not saying that there are no art exhibitions, just that when something worthwhile is out, it’s good to go have a look! 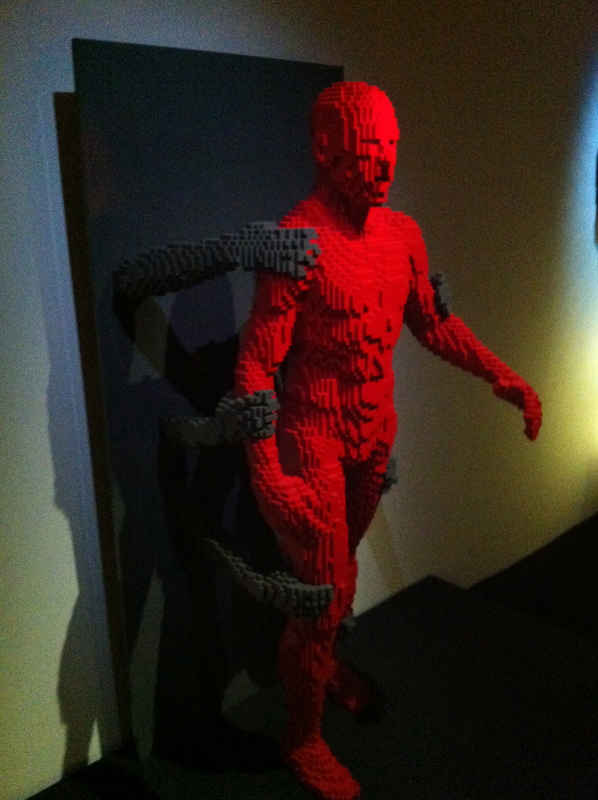 This week-end we decided to go see the expo “The Art of the Brick” at the Arts Science Museum. But once I was inside, it was really quite interesting!! 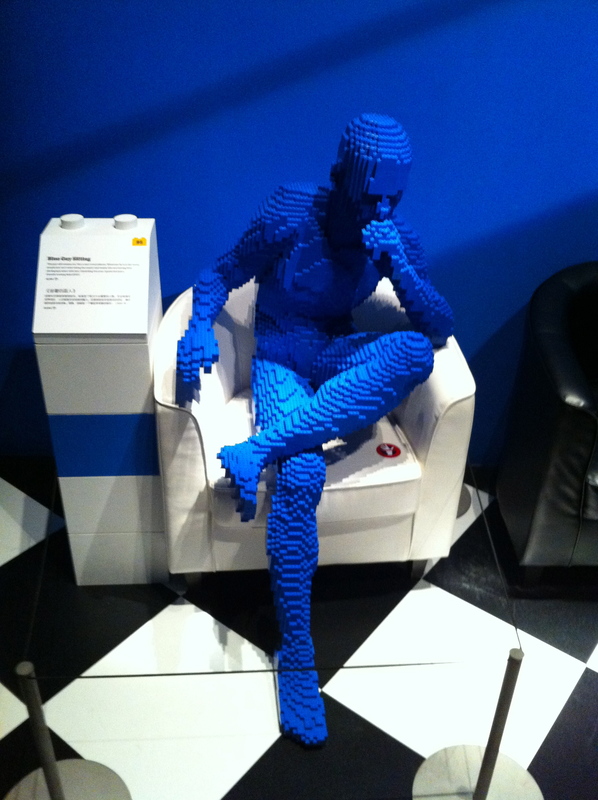 It’s amazing to see how much work the artist, Nathan Sawaya, has put into these pieces… Each art piece is at least a few thousands pieces of lego bricks and a few months of work! And the result is breathtaking! Breaking free… love this piece!! There were also places in the exhibitions where you could try to build your own lego art masterpiece, which was fun! And it definitely encourages creativity and makes you realize what the artist is doing really takes some sense of perspective and a whole lot of patience… Not to mention knowledge of the human anatomy and body proportions, which it seems Nathan masters perfectly! What I really liked is that the artist explored a variety of themes, and was really poetic about the way he presented it. I’m not a good art critic but I spent a great afternoon 🙂 Thank you Nathan! 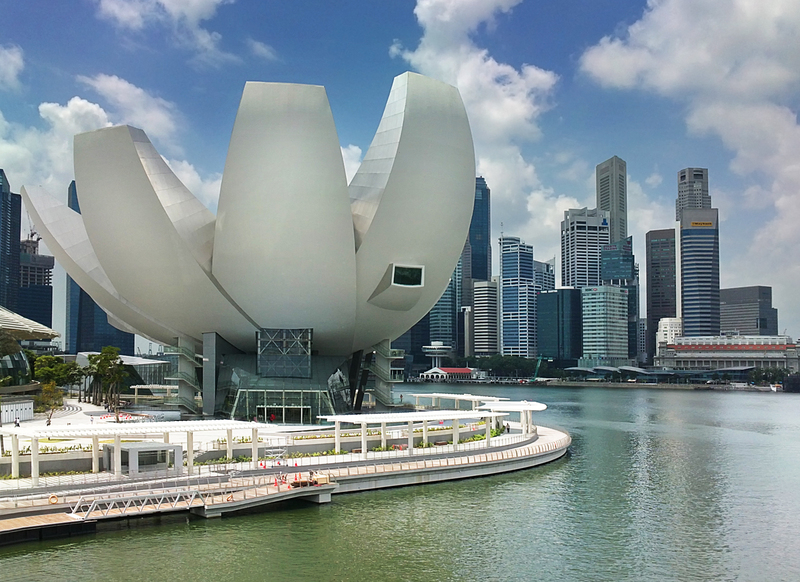 This visit also got me thinking… Why is it that in Singapore visitors like to leave with a picture of themselves? When we entered the expo we were asked to pose in front of a giant blank page holding a giant pencil, so that they could take a picture of us, and sell it to us of course. Surprising – to me – but also quite fun if you get into the game!! … I guess maybe it’s a cultural thing 🙂 And I must admit sometimes I like to be part of this photo-photo game myself !! 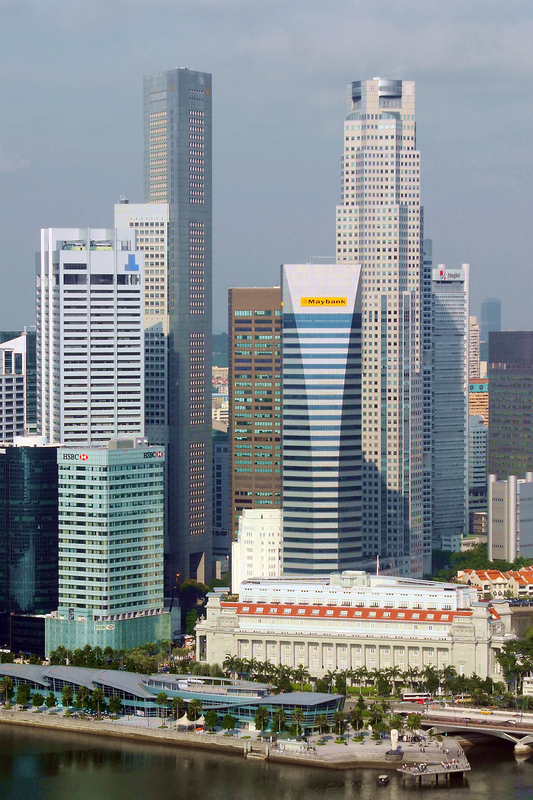 But can you spot the low old-looking building right in front of the towers? 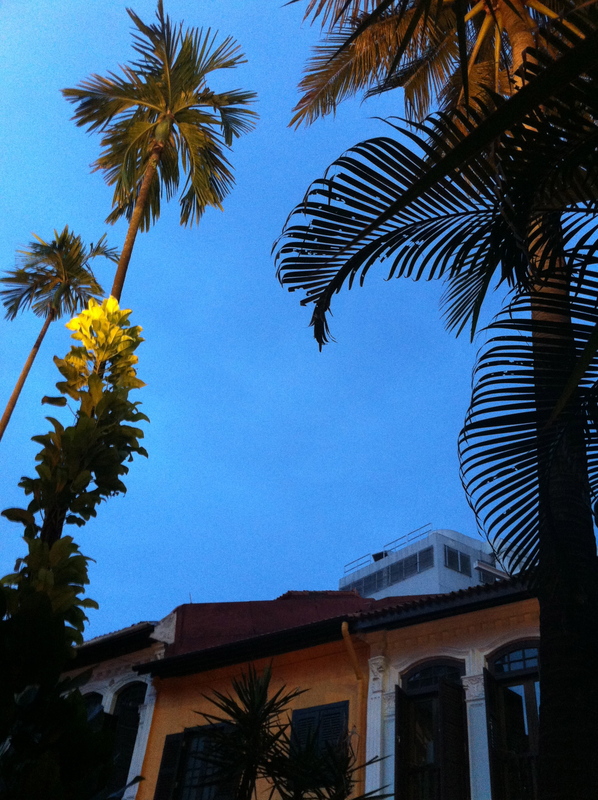 That’s the Fullerton Hotel. One of Singapore’s many colonial buildings that still exist today… Did you know that the Fullerton Hotel walls were built in 1928? 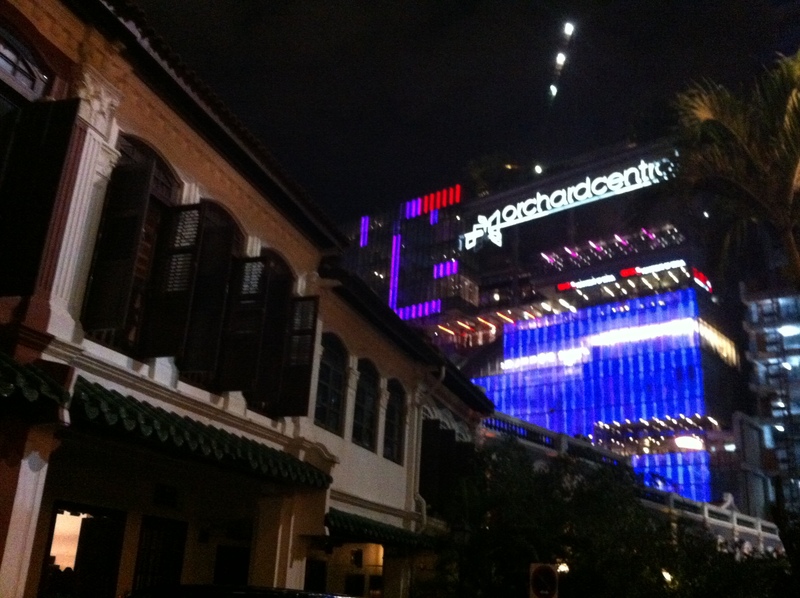 That’s how old some pieces of history are in Singapore. 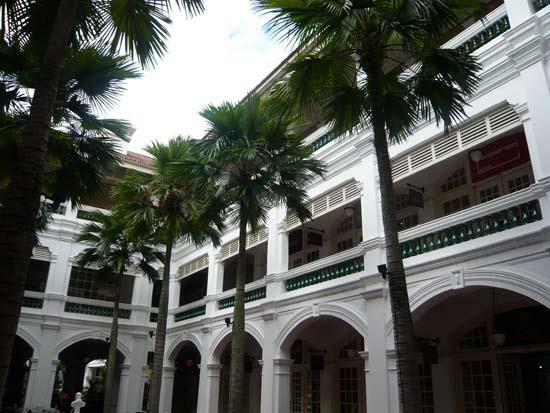 It was once the Singapore Chamber of Commerce, before it opened as a hotel in 2001. 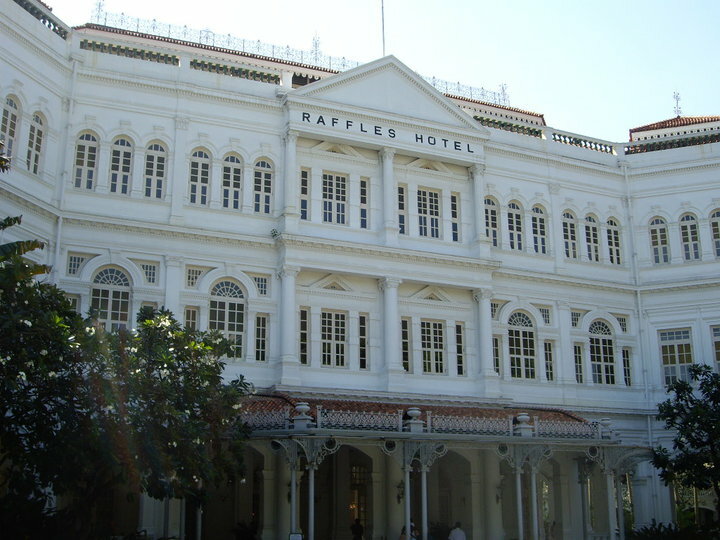 Still today, the Raffles Hotel remains an iconic landmark of Singapore. You can go have a walk inside the hotel and have a look at the luxury shopping boutiques. The inside courtyard is also splendidly taken care of, and you can really feel the luxury and long history of the site when you wander around for a while. 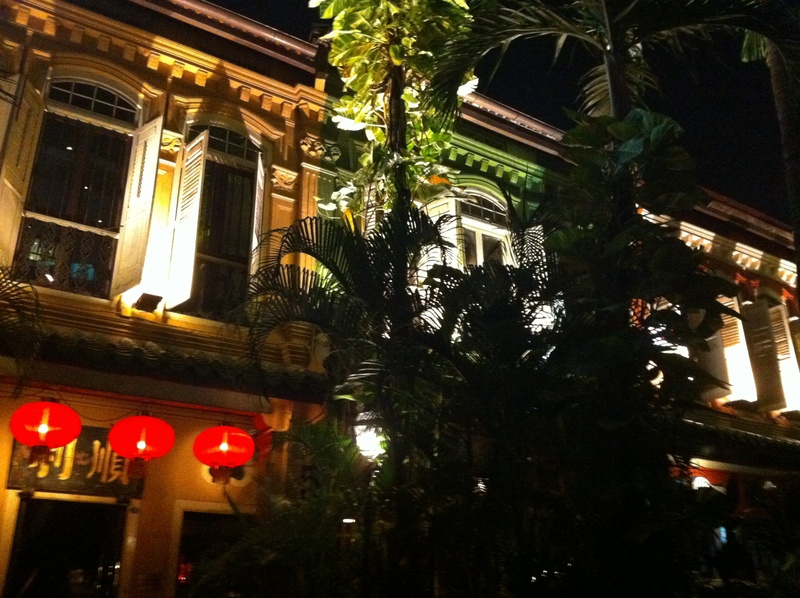 Of course, you shouldn’t miss out on the Long Bar, THE most famous place to have a Singapore Sling in Singapore… And you shouldn’t miss out on the Raffles Museum either !! Aren’t they beautiful? 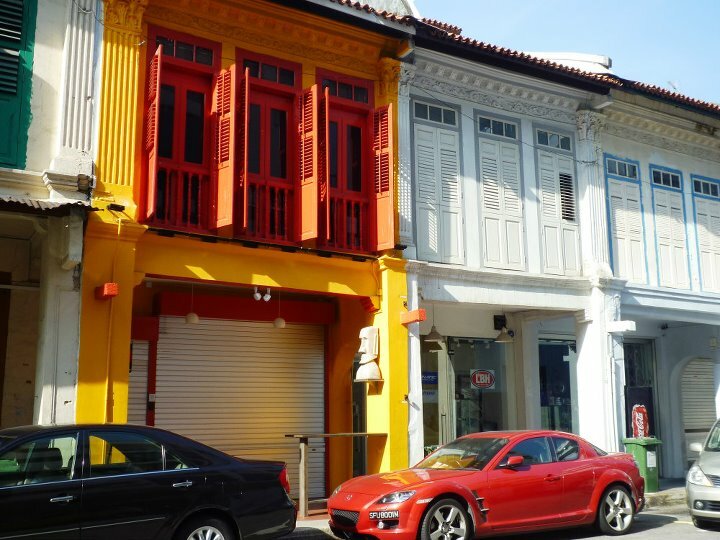 My favourite shophouses are located on East Coast Road. 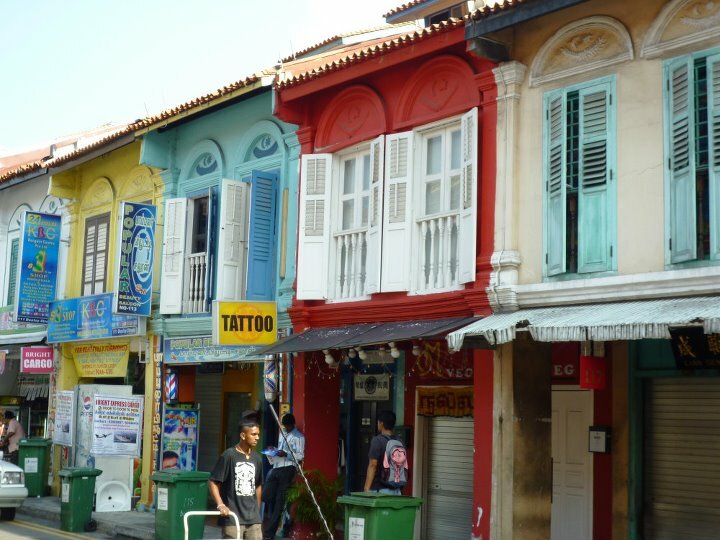 Their colours and detailed sculpted facades are simply gorgeous. 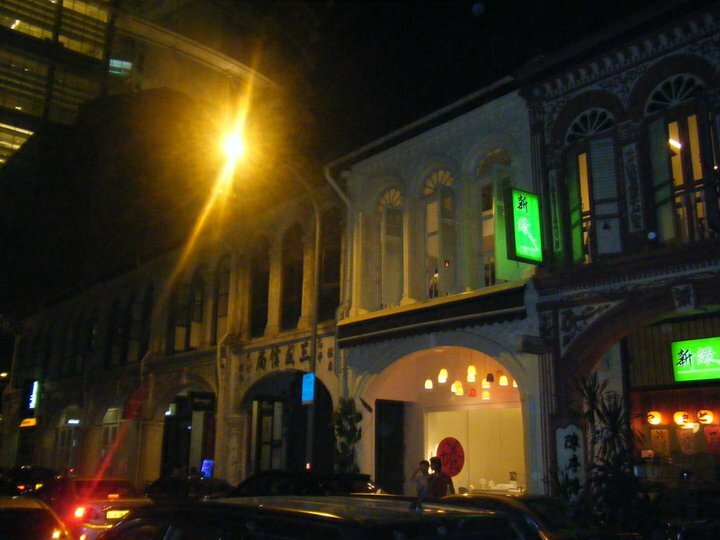 You can find them basically anywhere in Singapore, like in Chinatown, Little India, or downtown around the Raffles Hotel, like on Purvis Street for instance. 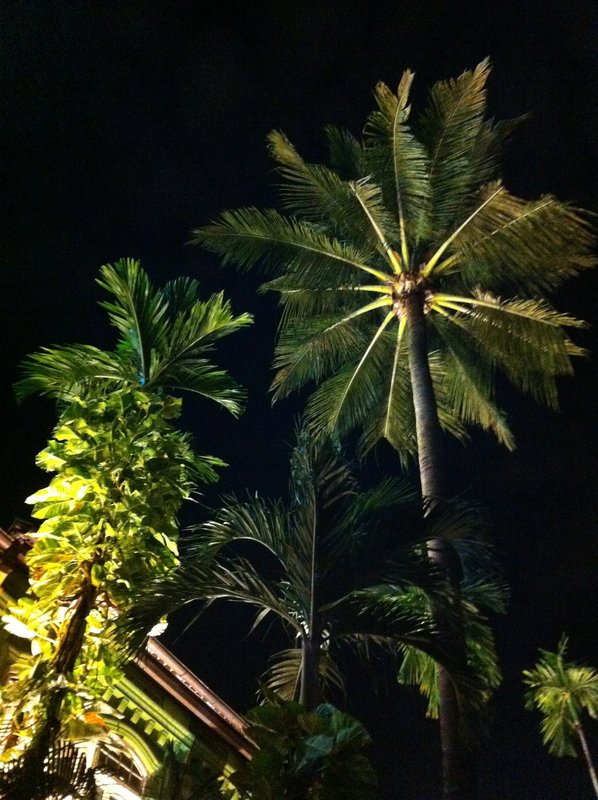 Needless to say, Singapore has many hidden treasures. And unlike what people may think, she is still taking care of leftover pieces of her very valuable history!! 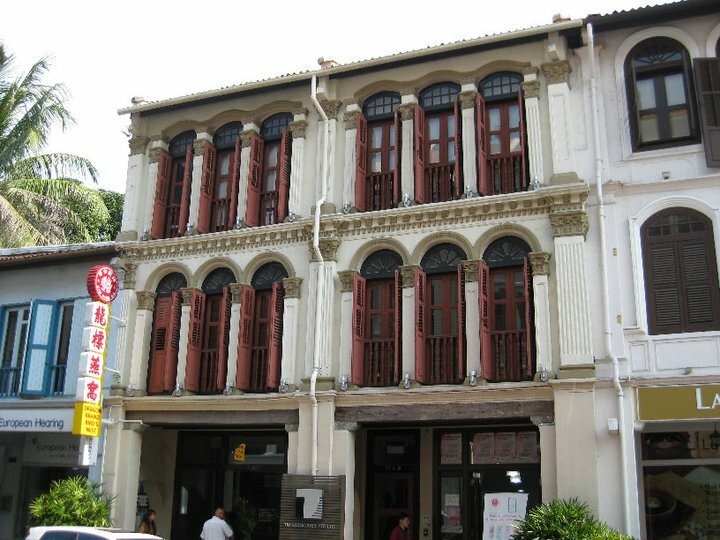 The URA (Urban Redevelopment Authority) is the organisation in charge of preserving this beautiful heritage.